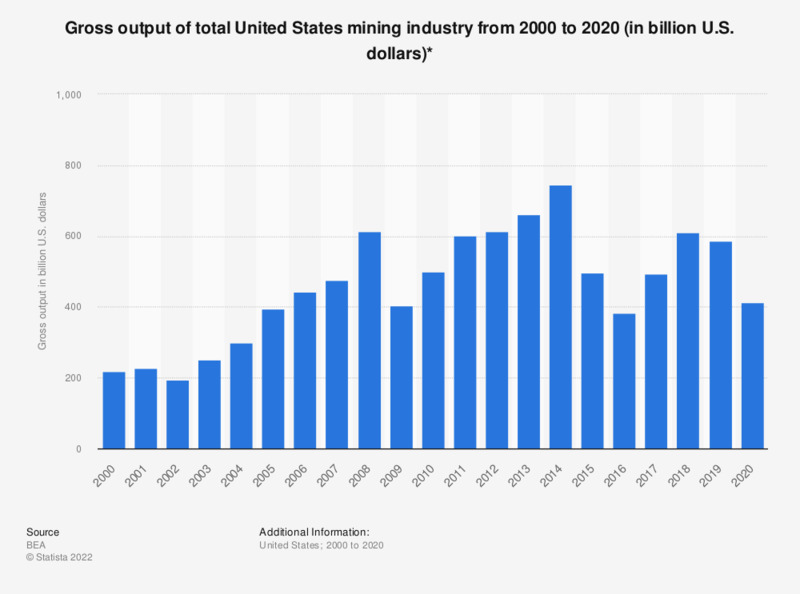 This statistic shows the gross output of the United States mining industry from 1998 to 2016. In 2016, the gross output of this industry came to around 488 billion U.S. dollars. The mining industry in the United States is a huge sector – especially when oil and gas extraction is included. In 2016, the industry generated a gross output of nearly 488 billion U.S. dollars. In 2000, this figure stood at just 218 billion. The value added through this industry was nearly 268 billion U.S. dollars in 2017, while this figure was around 81 billion in 1998. Employment in this industry has steadily been increasing over time. In 2000, employment stood at 521 thousand, and by 2016 this figure had increased to some 611 thousand. The leading U.S. metal and mineral mining companies are Nucor from Charlotte, Freeport-McMoRan from Phoenix, Arconic from New York, and United States Steel from Pittsburgh, and Alcoa from New York. Alcoa is a major player in the aluminum business, covering all segments of production from mining to recycling. In 2015, this company generated some 9.84 billion U.S. dollars in net sales. However, U.S. companies are not among the top five mining companies worldwide. The most predominant company worldwide is British-Swiss corporation Glencore International, which is active in every segment of the commodity business. In total, Glencore made approximately 153 billion U.S. dollars worth of revenue in 2016. However, a large part of this amount was not made from businesses connected with mining. Globally, the top 40 mining companies made some 496 billion U.S. dollars of revenue combined in 2016. All data was revised under the 2014 Comprehensive Revision of the Industry Economic Accounts.